Catching a glimpse of local wildlife as you drive can be a real treat. Encountering the majesty of untamed and untainted nature has a way of causing us to stop and take notice. However, there’s a big difference between enjoying a glimpse of nature out your side window, and being forced to slam on your breaks as nature rears up directly in front of your windshield. And of all of the animals that might find their way onto America’s freeways, the deer is by far the most common. It has been determined that deer-vehicle collisions cause upwards of $4 billion in damages, and approximately 200 motorist deaths every year. The roads become even more dangerous during the fall and winter months, as deer begin to mate and to migrate. So, in an effort to help keep drivers and deer as safe as possible, here are five tips to help you avoid a collision that could end up costing you far more than just the price of a new fender. You know those speed limit signs posted on the side of the road? Well, contrary to popular belief, they’re not simply there so that the local police department can earn their monthly quota. Traffic laws exist to keep you and other drivers on the road safe. Exceeding the speed limit—even when there is no one else around—is inherently dangerous, because the faster you go, the less reaction time you have. So, if you’re barreling down the road, doing 80 mph in a 65 mph zone, and a deer wanders out in front of you, you’ll have that many fewer fractions of a second to respond. Likewise, driving too close behind other automobiles can result in compounded damage should that car need to suddenly brake to avoid hitting an animal. If these concepts are wholly new to you, consider taking a locally-approved defensive driving course and brushing up on these important skills. Deer are natural prey to many different predators, which means that they tend to try and keep themself concealed when they can. Still, there are some telltale signs that may indicate that deer might be nearby. Some of these are actual signs, as in the kind that stand to the right of the road and display an image of a deer’s silhouette along with the words “DEER XING.” These aren’t just placed randomly around the country; their location is determined by the likelihood of deer being nearby, based upon migratory and population factors, as well as the availability of local watering holes. Other indicators include high brush or wooded areas along the side of the road—areas in which deer prefer to hide. Oh, and if you happen to catch sight of a deer, be extra cautious; they tend to travel in groups, and have been known to leap directly in front of cars at the last possible moment. Even if you don’t see any warning signs, remain alert while you’re driving. Avoid using cellular phones, being involved in distracting conversations with other passengers, or becoming too engrossed in your music selection. In fact, anything that draws your eyes, hands, or mind away from the task of driving is potentially dangerous. Be especially careful at dawn and dusk. Deer tend to be more active during the twilight hours, which just happens to be the time of day when human eyesight is at its poorest. When driving at night, use your high beams whenever there isn’t any oncoming traffic. Whenever you’re driving, you should pay close attention to what the other drivers are doing. If they begin to slow down, pull over, honk, or flash their high beams, it could indicate that they’ve spotted a deer. Don’t simply swerve around them and continue onward; follow their lead until you can ascertain the possible threat. It may seem like the last thing you would ever want to do is hit a deer, but the sad truth is that there are times when hitting an animal is actually the best course of action. If the only way to avoid a collision with a deer is to swerve into another car, or to send your own vehicle off the side of the road, then you’ll be better off just striking the animal. 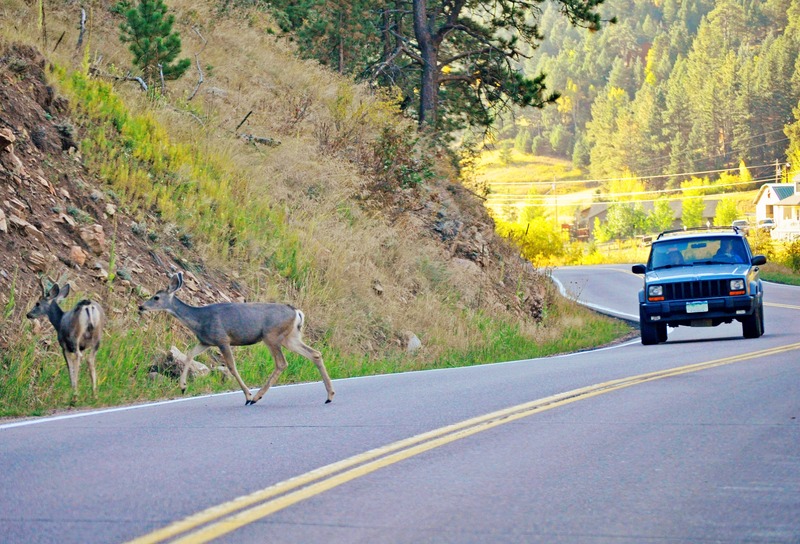 Hitting a deer head-on while slowing your car will give you a better chance of avoiding injury than attempting to swerve at the last minute, as the bulk of the engine will be between you and the animal. Besides, swerving abruptly can send your car into a spin or cause it to roll, which could end up causing far more injury to you, your passengers, or other drivers on the road, and as unfortunate as it is to see the carcass of a deer lying motionless along the side of the freeway, it’s even worse when the life that has been lost belongs to a person.